I'm fairly new to the blogging game, having started a site in December 2010. 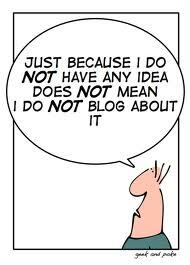 All blogs and their interconnections make up the term Blogosphere - originally coined in 1999 as a joke, but is now in common usage. For the classicists among us, the word comes from two Greek words meaning, "the world of words". I rather like that, don't you? 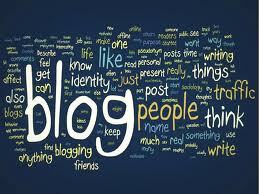 Blogs exist together as a connected community in which everyday, authors can publish their opinions. And what a community this is. The website BlogPulse catalogues all manner of information from blogs, and has a running total of the number of blogs at any one time. When we were thinking of starting a blog, many of us asked whether the world needed another blog. I've come to the conclusion that with over 161,000,000 blogs already out there, another one will not make much difference to the total. 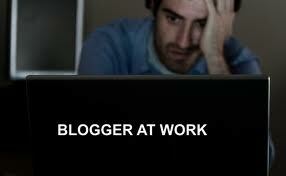 I doubt that there isn't a subject out there that someone isn't blogging about it. Though there are hugely popular sites promoting the likes of business, politics and so forth, I wonder how many of the huge number are like mine; just personal diaries really, outlining personal opinions that very few people will ever read. For many of us the value is in writing the blog, rather than the fact of someone actually reading it. Of course, when you hear that someone has read your blog, and passed comment on it, that is an added bonus. Also, as a blogging friend of mine (this is a new category of relationship) puts it, "One of the joys of blogging is reading the blogs of others - and discovering their enthusiasms or opinions". I read many other blogs, and try to select them on the basis of a variety of subjects. They could be specific to politics, religion, sport, education, music or miscellaneous, where the author covers a whole range of subjects. Mine is in the latter group, with a mixture of some rants, some observations, and some memories. That's the beauty of a blog; we write about our opinions, and our opinion is just as valid as the next persons. Specialist, professional blogs can be most useful in keeping up with what is happening in particular specialist fields. My son blogs a lot on education and music and they constantly challenge the old brain cells. However, I do like to balance the more professional works with those from people who are simply doing it from home, and talking about matters that have been personal to them. 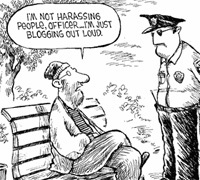 If you sat on a park bench and spoke out loud what you write in a blog, you could be accused of disturbing the peace, but nobody has to read your blog. It's not harassing people. Of the many beauties of blogging, and reading blogs, one is that you are constantly learning things. I may be a bit OTT here, but I think that in the last six months, in preparing for and writing blogs, I have improved my general knowledge more than at any time over the last ten years. 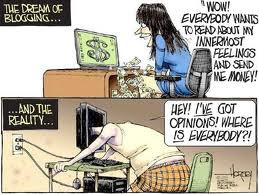 Inevitably with over 161,000,000 blogs they are not all edifying, instructive or a delight to read. Many are harmful, abusive and full of personal vitriol, and all done in the name of free speech. Even some blogs dealing with high profile subjects, and written in an acceptable way, are often spoilt by people in the comments section. Now vitriolic responses to a blog by others, is not something that I think I'll have to worry about, as my readership is probably in single figures, and I may know most of those people. Why can't people who disagree with what has been written do it with civility and without violation? Why abuse another because you disagree with their opinion? I don't know if you look at some of the BBC football writers blogs, where they comment on this team, or that player, then read the hundreds of comments that they receive, many are abusive and personally comment on the writer, and this is after many each day are not published because they have broken the 'house rules'. I've stopped reading the comments sections on a number of blogs that I follow, because it gets me so angry. 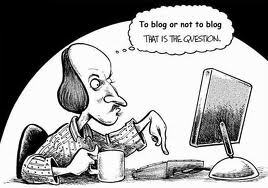 Why do writers of blogs, and those who comment on the blogs have to be at times so thoroughly unpleasant? This is not what free speech is meant to be. For a number of years, others have been similarly concerned, and in 2007, Tim O'Reilly proposed a voluntary Blogging Code of Conduct, which would be guidelines that bloggers would sign up to. In reading hundreds of adverse responses to his draft Code, I'm not surprised that it doesn't seem to have progressed very far. Many sites do of course have their own set of standards and house rules, but Tim wanted to make it easy for people, and to encourage every blogger to have a set of guidelines. The code was proposed due to threats made to a well known female blogger. In speaking to BBC News he said, "I do think we need some code of conduct around what is acceptable behaviour; I would hope that it doesn't come through any kind or regulation, it would come through self-regulation". O'Reilly and others came up with a list of proposed ideas that bloggers could use to enforce civility on their blogs by being civil themselves and moderating comments on their blog. In case you're as ignorant as I was about a Troll, it turns out to be Internet slang for someone who posts inflammatory, extraneous, or off-topic messages in an online community (such as a blog) with the primary intent of provoking readers into an emotional response, or to otherwise disrupting normal on-topic discussion. The draft Code says, "We believe that feeding the trolls only encourages them - 'Never wrestle with a pig. You both get dirty, but the pig likes it'. 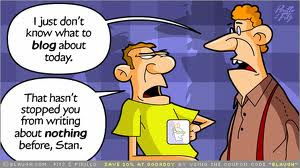 Ignoring public attacks is often the best way to contain them". I am happy with self-regulation. I want my blogs to be challenging, written as well as I can, and informative, but never abusive towards others. I also want any comments to be treated in the same way. I guess that this is a kind of code of conduct, and why should there be anything wrong with that? Good blogging achieves so much, and the freedom we enjoy in blogging should never be abused. What do you think? I finish with this cartoon, for no other reason than I can, and I like it. Keep on enjoying the "World of Words". John - we must get together for pint sometime - we obviously view the world very similarly. Your point above about the frequent 'abuse' on newspaper and BBC blog sites etc. is a thing that I find both worrying and sad. I contribute to the Guardian comments sites and am always disappointed with the way that others - clearly intelligent people - litter their contributions with expletives and crudity. I can only make the assumption that this level of crudity and abusive language is part of their daily life. I'm afraid it isn't part of mine.Perhaps, I've just reached a stage in my life when these things niggle! I do however feel that it diminishes the quality of their argument. The result is that I now only contribute on things I feel very strongly about. I don't mind my blog/post being criticised or disagreed with but I do object to the abusive language ad personalisation of the criticism.